TREVANIAN.COM has a new look. We will gradually be replacing material and adding new stuff in the coming weeks. 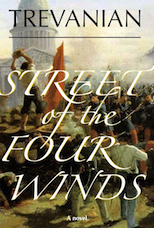 More news about Trevanian's epic novel Street of the Four Winds can be found here. When it was first suggested to me that we should allow Trevanian's characters from Shibumi to be used in a new novel written by someone else, I was not enthusiastic. As Trevanian's literary executor, the only project that interested me was bringing out Street of the Four Winds, the longest of the unpublished works Trevanian left after his death in 2005. First, Trevanian's name would be brought to the attention of a younger generation of readers, and sales of Shibumi and his other novels would be stimulated. It was pleasing to think of a fresh crop of Trevanian readers revelling in the marvellous creation that is Nicholai Hel. Second, many Trevanian readers would enjoy seeing the thriller genre's cleverest hero back in action again. Over the years many readers had expressed the hope that Trevanian would write another novel featuring Nicholai Hel, but he steadfastly refused, uninterested in covering the same ground twice. Here was a chance of granting, in an odd way, that old request. Now of course I also knew that, inevitably, some other Trevanian readers would hate the idea of another writer's borrowing Nicholai Hel -- but I reasoned that their admiration for Trevanian would not be diminished by what they perceived to be my error of judgment. The advantages of having Trevanian's name in prominence and his sales flourishing when it came to publishing Street of the Four Winds were obvious, and this consideration was foremost in my mind when at last I agreed to take the project one cautious step further, and allow Michael Carlisle and Richard Pine to start looking for a writer. After all, I couldn't make my mind up in a vacuum. Theory is one thing, reality another -- and how could I be either in favor of or against a book that was still unwritten, by an author as yet unknown? I was further braced by the knowledge that Trevanian himself had not been against the idea when it was mooted to him some time before his death. While he had no desire to write about Nicholai Hel again himself, he was not hostile to the idea of Nicholai's coming to life again -- but only under certain conditions, of course. The character of Nicholai Hel -- the aji of Nicholai Hel -- must be respected, and the book must be of a quality that would not disappoint his readers. The search for a writer began and led swiftly to Don Winslow, a talented thriller writer whose knowledge of the Orient, of military history and martial arts suited him admirably to the task. Winslow had read Shibumi when it came out, and felt such enthusiasm for the book that he had even learned to play Go. Here then, was an exceptionally good choice of writer for the project. Then Richard Pine thought of a matchless title: Satori. So far, then, so good. But the breakthrough came for me with my realization that making the book a prequel, instead of a sequel as first suggested, would have the double advantage of leaving in place in the strong and beautiful ending of Shibumi while also solving the problem of finding a story line for the new book. In Shibumi Trevanian outlined the plot of Hel's first 'stunt' after he was released from imprisonment by the Americans. 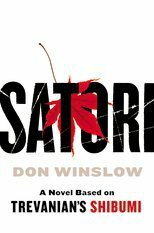 This outline serves as the basic plot of Satori, but Don Winslow hangs upon these bare bones an intricately woven and richly embroidered story that is all his own. In Satori Winslow presents many colorful new characters, the fruit of his imagination, but we also see old friends from Shibumi : Hel's mother, Alexandra Ivanova; Diamond's elder brother (whom we had only heard about from Trevanian, and who takes shape under Winslow's pen); the information broker, Maurice de Lhandes (who in Satori acquires some of the bawdy speech patterns of Shibumi 's beloved Le Cagot); and of course Nicholai Hel himself -- linguist, caver and mystic, equipped with his extraordinary proximity sense and the ability to kill using everyday objects, lover, assassin, gardener and player of the Japanese game Go. Writing something new of one's own while still respecting the perimeters set out by another writer is a tricky job -- particularly with a nervous literary executor hovering just out of sight -- but Winslow has pulled it off beautifully, producing a book that should enchant Trevanian and Winslow fans alike, and create many more of both. In Satori we have a book that Don Winslow and the Trevanian Estate can be justly proud of. Don Winslow, you've done a wonderful job. Thank you. It was Trevanian’s wish that I edit this epic novel, his magnum opus, and carry it through all the stages to publication -- but not until I had finished and sold the novel I was writing at the time of his death. That was his fatherly stipulation -- stipulation because he was always very firm about doing things in the correct order, and fatherly because I am Trevanian’s elder daughter. Now at last I am fulfilling my promise to him and to his readers. I spend my afternoons immersed in the Bohemian world of Paris in 1848 – a time when unbridled capitalism and the greed of bankers and money-lenders had made life impossible for the common man – a time, as you see, very like our own. Such richness! Such joy, but also such melancholy, hearing Trevanian’s voice again! Friends, a real treat awaits us all.